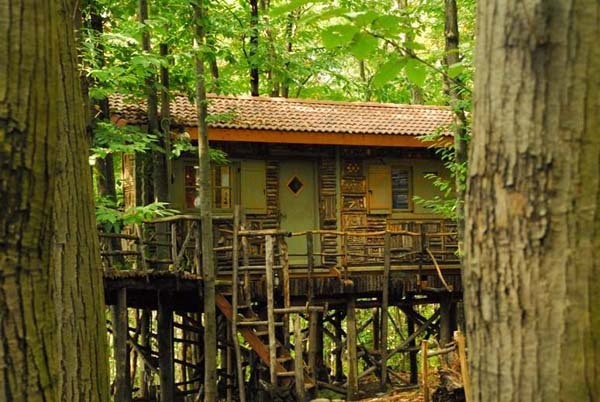 Camouflaging in the forrest and living on a treehouse! I don’t know anything about this treehouse, but I find it very fascinating! A very simple form with terrace like a normal house, but if you pay attention at the picture it has a very sophisticated wooden decoration. For the ones who knows something about architecture, the decorations of this treehouse remind me the ones of the Prairie Houses of Frank Lloyd Wright. Here it has been created a decoration for the façade just using sticks. Everything is geometric and nothing has been left to chance. The colour of the window and door, the decorations, everything is well studied and how we are used to say in architecture: “every elements speak the same language” so that the final result is harmonic and an “inviting” treehouse architecture.